There’s an election headed our way and depending on how you feel about your state/city/town it could be exciting. Here in New York City we’re poised to have our first new mayor in 12 years. Whether you’re relieved at that prospect or leery, the fact remains that change is never all that easy. Neither of the two viable candidates has anywhere near the celebrity status that Mike Bloomberg had/has. 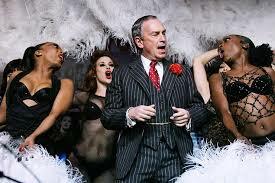 Mayor Bloomberg has the star power that comes with great wealth. He is able to exert influence on a national if not international level. That power impacts the local constituency if in no other way, than in that of confidence. A mayor that can buy his way in and out of just about anywhere and anything is not likely to be told to drop dead by any leader anytime soon. There are New Yorkers who felt Bloomberg as mayor was a bully or at least too paternalistic for their taste. Some felt him too liberal (anti-gun) or too conservative (pro-business.) It’s probably safe to say that he is all of those things and a bit bombastic to boot. He stuck like super glue to his convictions/beliefs and if you happen to agree with those beliefs that was good. Some of his best moments have been fighting to preserve the separation of church and state. NYC is filled with many different cultures and religions and it would be ridiculous to even suggest that they all get along or want the same things. Each religion is defined by how it differs from other beliefs and those beliefs sometimes make their way to City Hall. You may remember the brouhaha over the Muslim Cultural Center built on the site of a former Burlington Coat Factory. Mayor Bloomberg supported the center and its message of religious tolerance, amidst fear based propaganda and bigotry. The Mayor has been on the side of inclusion but shied like an abused horse in the face of preferential treatment. He has resisted several requests from religious groups over his tenure, presumably in an attempt to keep religion out of government and vice a versa. It’s unlikely the next mayor will do the same. There is already much being made of the candidates’ positions on religious issues. Those issues most cited are; Muslim holidays included in the school calendar, ultra-orthodox circumcision practice, and churches using schools for worship. On the surface this appears to be a nice little trifecta. These are the religions most discussed in the media (though not necessarily an accurate representation of NYC residents.) We’ve got a Muslim issue (check!) a Jewish issue (check!) and a Christian issue (check!). Of course ultra-orthodox anything is by definition not representative of the larger religious group and Christian anything rarely includes Catholic something. But never us mind. It makes for a nice little “we are the world” media package. Any religious holiday that precludes a student or teacher from working should be included in the school holiday calendar. There is no religious reason for anyone to not attend school/work on Christmas, but public schools have always been closed on that day. There are many holidays outside of Christianity that are to be spent in religious worship. That should be the determining factor. Many religious festivals and holidays allow for work, they should not be included in the calendar. It’s that simple. The orthodox (or fundamentalists) of any religion enjoy a certain degree of autonomy. They intentionally live outside society but often avail themselves of societal services. If a religious practice causes harm to anyone (herpes in the case of ultra orthodox circumcision) it should be regulated. As a society we believe in protecting the health and well being of others. There are ways to regulate the procedure (no need to get graphic here) that would limit exposure to disease. These issues, though somewhat novel are not that complicated. They address equity and health and don’t infringe upon anyone else’s freedoms or beliefs. (A mohel or two might be bent out of shape, but they’ll come around.) However holding religious services in a public school infringes upon the rights of just about everyone except the worshippers. Imagine just for a moment that it was a collective of imams wanting to hold Muslim prayer services in the public schools. It’s hard to imagine anyone saying; “eh what the hell, the school is empty anyway.” Public school is just that: public. It is in theory a safe haven and a place in which everyone is presumed equal. Being part of a minority, which in America is anyone who isn’t Christian, is challenging enough. No kid, or teacher needs to be reminded that Christianity is normative. Seeing your local school used as a church is disheartening. We attach an awful lot of importance to the buildings in which children learn. We even tear them down when something awful happens within the walls. To transform a school into a church can be alienating and even feel threatening. On top of the very real emotional response is the fact that schools are government buildings and have no business being used for religious practice. It is not clear, from anything they’ve said, that either mayoral candidate sees the church and state issue at play. Granted there are actual life and death issues at stake in NYC with which a mayor must contend. But how we regard religion and walk that line between inclusion and separation says loads about us. How we view and treat each other is at the heart of almost everything else that there is and ever will be.